The Castle of Bashtova is part of the Tentative list of Albania in order to qualify for inclusion in the World Heritage List. Albania is a country which seems to “dribble” in additions to its T List, unlike others which have wholesale revisions every 10 years or so. In 2017 Bashotva Castle was added – could this mean that nomination activity might soon follow? It sits only around 15kms off the Berat - Durres highway so we decided to take it in as we passed nearby in Apr 2018. Well there is nothing really to write about! There were no entry "barriers", no fees, no "tourist paraphernalia" such as interpretation boards, and no other people ... anywhere near! It is a very large and empty square shell of 4 walls (photo of 1 "corner"). It was built by the Venetians in the 15th Century (possibly over earlier fortifications) and its current main claim to fame seems to be that it lies in a flat area of land near to the Shkumbini River estuary – whereas most castles in Albania are built at the top of rocky crags. When built, it might have been more able to make use of water as a defensive element but subsequent sedimentation and river movements have left it "high and dry". So the T List description states that “The special feature about Bashtova castle, is that it is the only Castle in the Balkans built on a field.”! That would not surely be enough to give it OUV even as an addition to the existing “Venetian Works of Defence”. My Web searches have thrown up some surprising facts about the castle and its current uses and plans – none of which would seem to support its possible future inscription! It appears that Bashotva Castle has, since 2009, been the subject of a “Revitalisation Project”. See - “Heritage for development in South East Europe”. 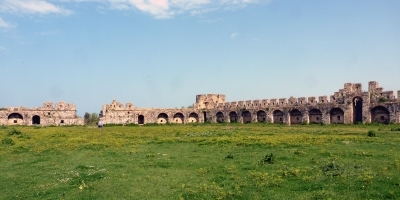 Activities arising from this have included holding a music/culture festival, offering to lease it to private bidders for a period of 20 years, holding the Miss Albania Beauty Pageant in 2012, featuring it at the 2012 Venice Architecture Bienniale and, in conjunction with UNESCO and IMC (International Monuments of Culture), issuing requests for possible projects for future use. Only 3 submissions emerged and none was regarded as of “sufficient quality” - this one proposed turning it into a solar plant and “multi-functional space.”!!!! How all this fits in with adding it to Albania’s T List is unclear - perhaps placing it there was aimed at raising its profile for a totally different final conclusion than “Inscription”. It is perhaps also indicative of the number of “unlikely” sites which have been placed on the T List. Whatever - Albania seems to be “stuck” with a castle in a field which it doesn’t know what to do with! Any offers?